In Damming the Osage we question the wisdom of the seven multipurpose Corps of Engineers dams and reservoirs built on the Osage River. The case we make against these public works projects is based on the flawed logic of the Pick-Sloan Plan that asserted that there was enough flood control storage behind government dams to avert flooding on the Missouri-Mississippi river system. This has proven not to be true. There was a strong lobby to build these water resource control projects; the Army Corps of Engineers cannot be held solely responsible. When the Osage is low, Lock & Dam No. 1 is revealed to be a wreckage of wood, concrete, and steel. It should be removed before it fails. That it is privately owned complicates this costly necessity. Mr. Rice’s rash decision to buy this misconceived project has continuing consequences. The Corps is a curious mixture of superb engineering skills and source of grotesque information. One of the dumbest projects in their history was the construction of Lock and Dam No. 1 built in the early 1900s about ten miles from the Osage River’s confluence with the Missouri. It was built to facilitate virtually non-existent steamboat travel and commerce on the river. The Corps discontinued operation of the lock and dam in September 1951. It had been problematic from the beginning from an engineering standpoint and by the time the Corps got tired of maintaining it, it was badly deteriorated. While many of the projects the Corps builds are of questionable justification, this bureaucracy is not stupid. WHAT DOES MAN DO WITH LOCK AND DAM? James N. Rice soon will become the owner of a genuine United States government lock and dam – but dam if he knows what he’s going to do with it. The property is U. S. Lock and Dam N. 1 – there never was a No. 2 – on the Osage River. It’s 14 miles southeast of Jefferson City, near where the Osage empties into the Missouri. Rice will become the owner because a bid of $10,500 he submitted proved to the highest among 20 received by the General Services Administration. Rice, 42, a bachelor who works for the State Detective Bureau, was surprised when a newsman told him the GSA had accepted his offer. What will he do with his acquisition? “Dam if I know. I hadn’t given the matter any thought because I had no idea my bid would be high enough. I like to fish, and I understand the fishing is real good out there. I guess that’s what was in the back of my mind when I bid on it. I might make a resort out of it sometime. The rundown property includes about 10 acres of park-like land beside the river, three old frame houses, and several lesser structures. The concrete-base dam is 17 feet high and 220 feet long. Its lock is 42 feet wide. 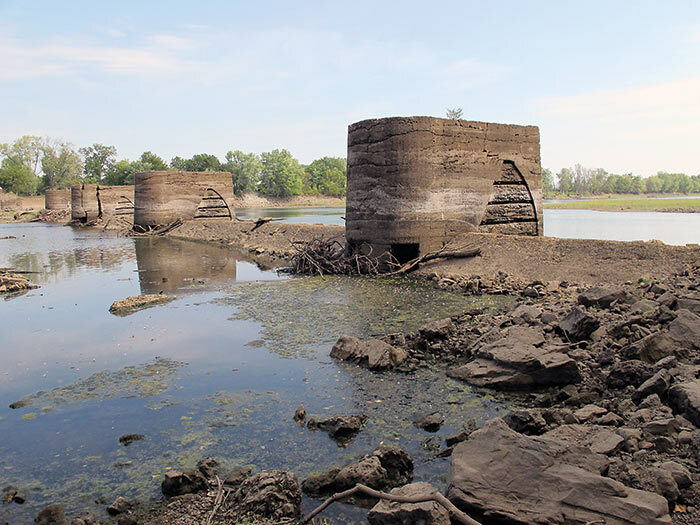 The facility was built in the early 1900s to provide water for shallow-draft barges to make it up the river as far as Warsaw, Mo., 173 miles from the mouth. River traffic in those days was heavy, but construction of Bagnell Dam 25 miles upstream in the 1930s put No. 1 out of business. The Corps of Engineers maintained No. 1 until nine years ago. Then it tried to lease the property to some civic, fraternal or conservation group – free, except for maintenance costs. There were no takers. One reason was that there is no way to get to it except by a privately owned road or by the river. This doesn’t worry Rice, who figures he can work an agreement to use the road. Photograph from May 1, 1960, Kansas City Star. The caption reads: “The new owner of Osage Lock and Dam No. 1 looks over a part of his property. 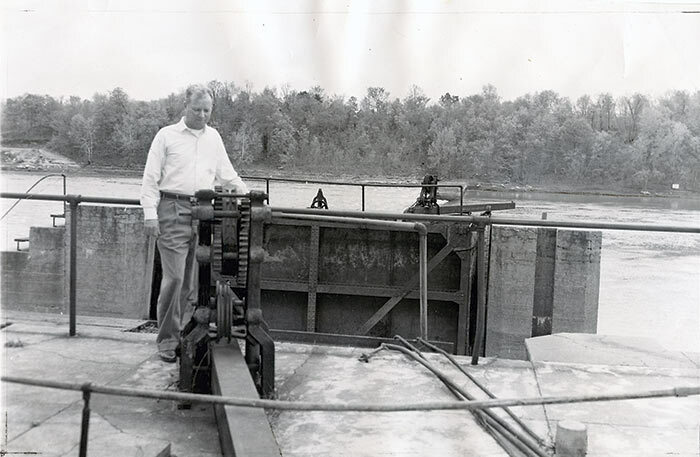 James N. Rice of Jefferson City “private eye” and avowed fisherman, examines part of the rusty mechanism that opens and closes the locks on the Osage River near the capital city. Not much came of his development plans. Since then, it has even further deteriorated and could collapse. It is in a perilous, sad state of disrepair. We’ve discussed the ramifications of this extensively in a separate section of this website (http://www.dammingtheosage.com/lock-and-dam-no-1-on-the-osage-river/ ) and linked to studies and reports by various government agencies that study and protect wildlife. Lock & Dam No. 1 is a hazard to navigation and has caused drownings. The potential legal liability to the private owners of this ruin is enormous. Give the Corps credit for anticipating these issues and divesting themselves of this dysfunctional disaster-waiting-to-happen.